This story was originally published by The Seattle Times on Jan. 3, 2019. The tax would be levied against property owners within a district stretching from T-Mobile Park to Denny Way and from Elliott Bay to Interstate 5. 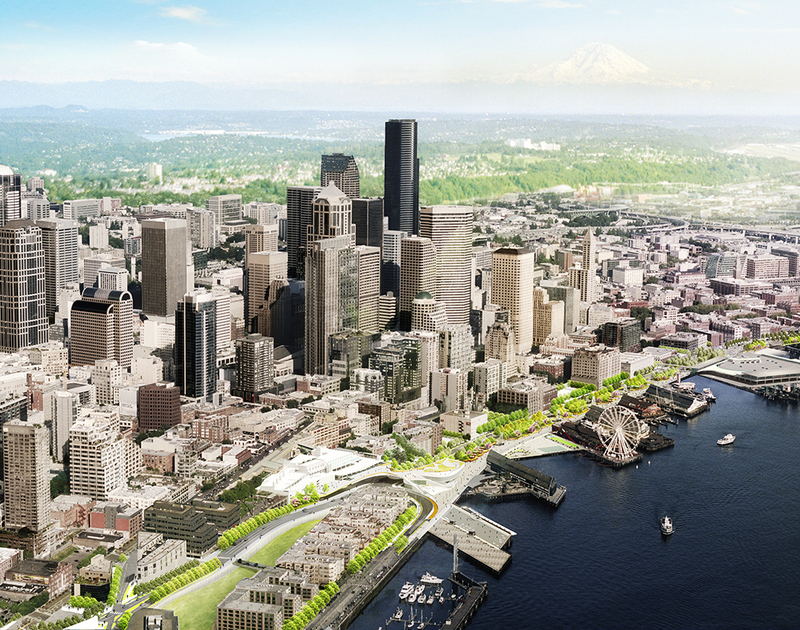 Mayor Jenny Durkan announced a step Thursday toward remaking Seattle’s waterfront after the demolition of the Alaskan Way Viaduct with a new park, a promenade and a pedestrian connection to Pike Place Market. The city has reached a deal on taxing downtown property owners to help pay for the project, the mayor said. It did so by reducing the size of the proposed tax and by giving some property owners input on the waterfront’s design and operations. After months of closed-door negotiations, the agreement between the Durkan administration and a group of property owners clears the way for the mayor to propose legislation creating a $160 million local improvement district (LID) for the $712 million waterfront project, which also includes the construction of a new Alaskan Way, a landing where the Seattle Aquarium intends to build a pavilion with a shark exhibit and walking improvements for nearby streets. That’s much smaller than the $200 million LID that for many years has been a part of the city’s waterfront plan. Private donations and the city’s existing commercial-parking tax will make up the $40 million difference, according to the administration. Authorized by state law, LIDs allow cities to generate money for infrastructure projects by assessing nearby property owners who stand to benefit through property-value increases. The property owners included in a LID pay a percentage of their anticipated “special benefits.” Those closer to a project pay more, based on their greater anticipated benefits. Along with the LID, the administration’s waterfront plan calls for the city to contribute $249 million, the state $193 million and private donors $110 million. 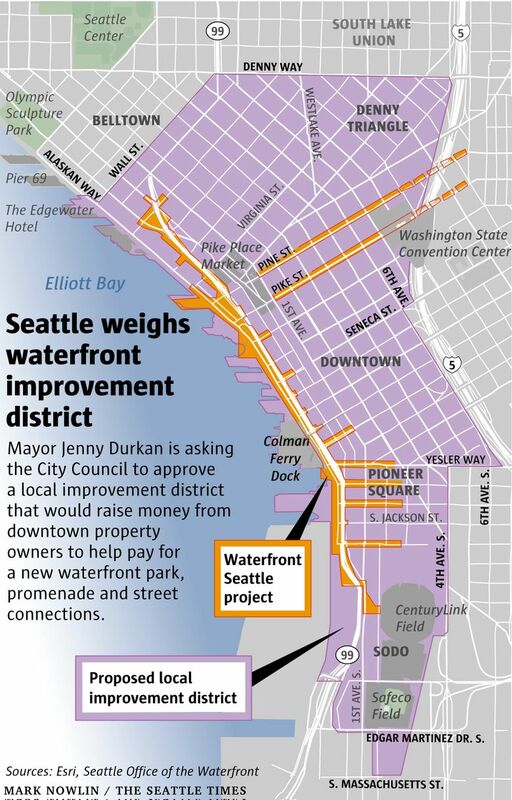 Durkan’s legislation would commit the nonprofit Friends of the Waterfront Seattle to raising the $110 million in donations and would establish a partnership between the city and the organization to manage the new public spaces. For the property owners affected, “the investment will be more than worth it,” Durkan said at a news conference at the aquarium, expressing confidence the council will approve. Under her proposal, the median commercial-property owner in the LID would pay $5,900 and the median condominium owner would pay $1,900. The median charge per rental apartment would be $1,040, with landlords choosing how much to pass on to tenants, according to the administration. Property owners would have the option of paying right away or over 20 years, with interest. The mayor described Thursday as an important milestone. The new waterfront will attract locals and tourists from around the world, rivaling New York City’s High Line, Vancouver’s Stanley Park and Seattle’s own Space Needle, she said. “It is incredibly rare that a city has a chance to take on a project in a built environment like ours that will totally transform that city,” Durkan said. The mayor’s office didn’t immediately make public the agreement with the property owners and the legislation that would create the LID. For years, the city has planned to construct improvements along the new waterfront road after the opening of the Highway 99 tunnel under downtown and tearing down of the viaduct. The Durkan administration had hoped to send the LID legislation to the council in November but was delayed by the talks with property owners, who have the power to veto the LID by drumming up a certain amount of opposition. Protest letters from property owners representing at least 60 percent of the money would block Seattle’s waterfront LID. Those representing more than 50 percent of the money protested last year and others issued threats, pressuring the city to negotiate. There are many more condo owners than large commercial-property owners downtown, but the latter held more sway in the LID talks because their properties are more valuable. They sought assurances on issues such as homeless camping. Land-use lawyer Jack McCullough, an influential player in Seattle politics, represented some big-time property owners in the talks, which were held in private. A group calling itself Waterfront Park Conservancy struck the deal with the city. The Durkan administration’s agreement is with property owners representing 51 percent of the money, said Marshall Foster, director of the Office of the Waterfront. The administration was still collecting signatures Thursday, Foster said. In a statement, the Downtown Seattle Association hailed the news. “The legislation proposed today will ensure that the central waterfront park is welcoming, clean, safe and attractive,” the statement said. Some condo owners who opposed the LID are unhappy. “This is disappointing but not unexpected,” said Bob Stevens, who lives in the Waterfront Landings complex on Alaskan Way. Besides limiting the LID tax to $160 million, the deal says the city will budget at least $4.8 million per year for waterfront public-space maintenance and operations, starting in 2023. The agreement also says the city will allow a group of commercial-property owners to weigh in on the new park’s design and create an oversight committee for the waterfront’s management with seats for LID property owners, community members and nonprofits. The committee members would be appointed by the mayor and council.